Every month new patches come out for Windows that sometimes require a reboot. Windows 8 and Windows 7 can force a reboot while you are in the middle of working or left your computer idle for a little as five minutes. In Windows 8, Microsoft removed the ability to indefinitely postpone reboots while you were actively using your PC which can result in lost work if your applications running do not have an auto save feature. 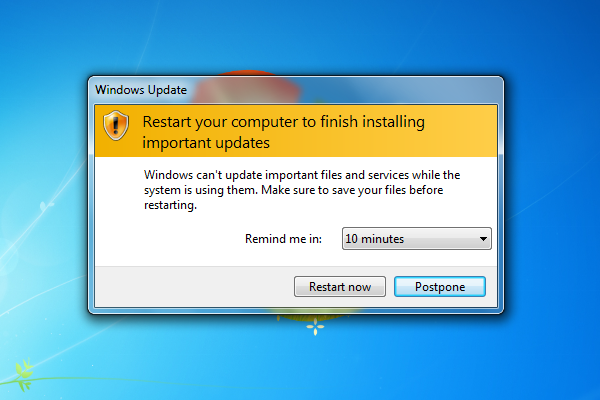 There are two methods used to disable forced Windows Update Reboots. You can use a registry key that works on all versions of Windows 7 and 8 or you can use group policy that is very helpful in a corporate environment with a Windows Domain so you can blast the settings out to all PCs on your network. Open Registry Editor and create a DWORD called NoAutoRebootWithLoggedOnUsers under HKEY_LOCAL_MACHINE, SOFTWARE, Policies, Microsoft, Windows, WindowsUpdate and finally AU. The value of NoAutoRebootWithLoggedOnUsers must be set to 1 to enable and 0 to disable. Alternatively, I have created two registry files that enable and disable the value for you. Just download and double-click on them to import. Open Group Policy editor and navigate through Local Computer Policy, Computer Configuration, Administrative Templates, Windows Components and Windows Update. Locate “No auto-restart with logged on users for scheduled automatic updates installations” and right click on it and select Edit.